Thanks to you all for a brilliant effort. Around 400 trees were planted on and around the Derby Road playing fields in New Mills on Sunday and Monday, in a joint project between Transition New Mills and Thornsett School. Thank you to everyone who cleared the ground, put out the marker canes, planted trees, put on and checked the guards, contributed cakes and made tea. Also thank you to those of you who turned up after we had finished on Sunday – sorry our volunteers were so efficient – and to those who expressed their interest and support but couldn’t help on the day. Thank you to the head, staff, children and parents at Thornsett School. We hope you are proud of your contribution and excited about the prospect of watching the trees grow and seeing the wildlife thrive as a result. We are relying on you to keep an eye out for the trees and to help make the whole of your local community feel that the trees belong to them. We hope that this is just the beginning of bring more trees back to the area. The Woodland Trust is giving away nearly 5 million trees to community and school groups in the UK over the next 3 years. We would be happy to bid for more trees and organise another event next Autumn. All we need is some land – so if you have spare land yourself, or know someone who does, or can suggest a suitable plot, please let us know. SUNDAY 15TH NOVEMBER 10.00 – 3.00 AT DERBY ROAD PLAYING FIELD. The trees have arrived and are eager to be planted in their new home, in a joint project between Transition New Mills and Thornsett Primary School! Thank you to all who have offered to help. Anyone else who is free for an hour or so on Sunday, please come along. Please bring you own spade and gardening gloves if you have them. Tea and coffee and cakes will be provided. Contributions of cake will be very welcome. Derby Rd playing fields are at the end of Portland Rd (where there is some parking). If you are coming along High Hill Rd from Hayfield Rd, Portland Rd is the first right turn after the mini-roundabout. The trees which have been provided by the Woodland Trust are oak, hawthorn, rowan, blackthorn, silver birch and hazel. 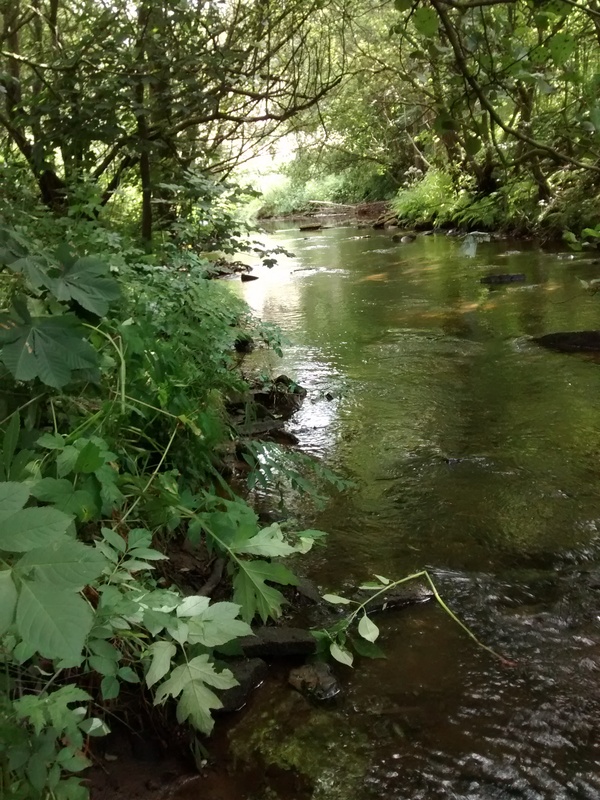 These species have been selected to provide a range of food sources and habitats in order to increase biodiversity. Derbyshire County Council Pension Fund has £290 million invested in fossil fuel industries, including Royal Dutch Shell, BP and Rio Tinto. Fossil fuel industries make up nearly 6% of the pension fund. The petition calls on DCC to immediately freeze any new investments in fossil fuels and divest from direct ownership and any commingled funds that include fossil fuel public equities and corporate bonds within 5 years. The next meeting of the Transition discussion group is 8pm Monday 30th November in Marple Bridge. Please let Sue Cooper (suecoopernewmills@hotmail.com) know if you want to co-ordinate transport from New Mills to Marple Bridge and also let her know if you are coming. 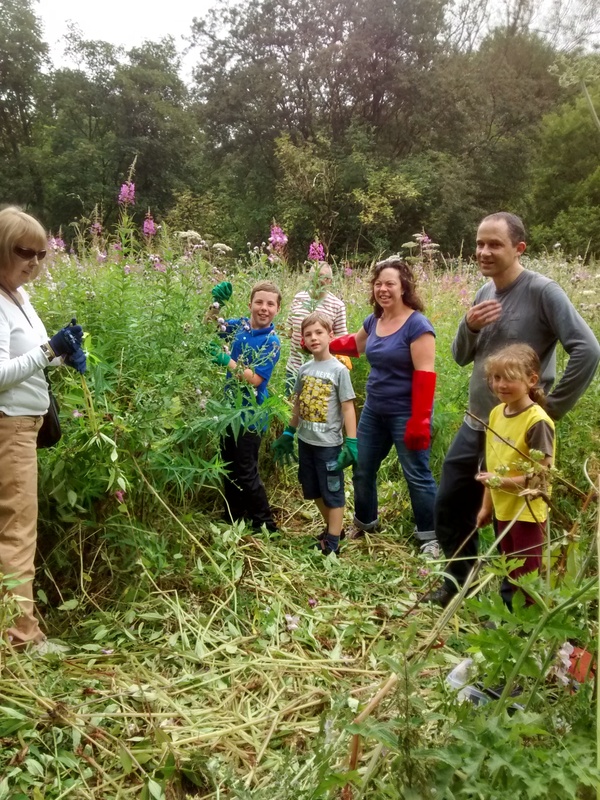 The balsam bashing season is over for 2015, and thanks to our wonderful volunteers, a Derbyshire County Council grant, and donations from local businesses, it was the best one yet! The areas we focussed on were The Torrs (Sett Valley from trail to Archie), Goytside(from Archie to railway viaduct), Mousley Bottom (around riverbanks and on DCC land), and The Picker. River levels were quite low, which helped us safely access the banks. 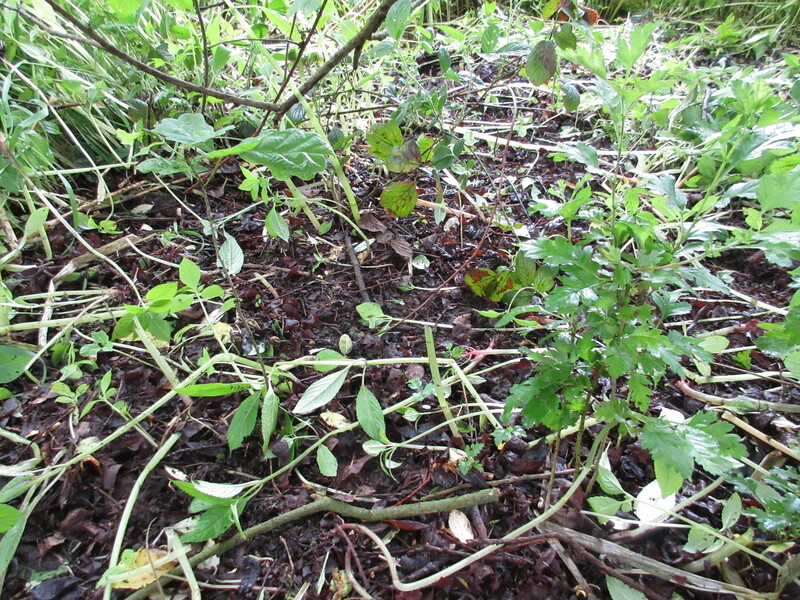 The Torrs, Mousley Bottom and Goytside had been tackled last year also, and much less balsam was noted in these areas. 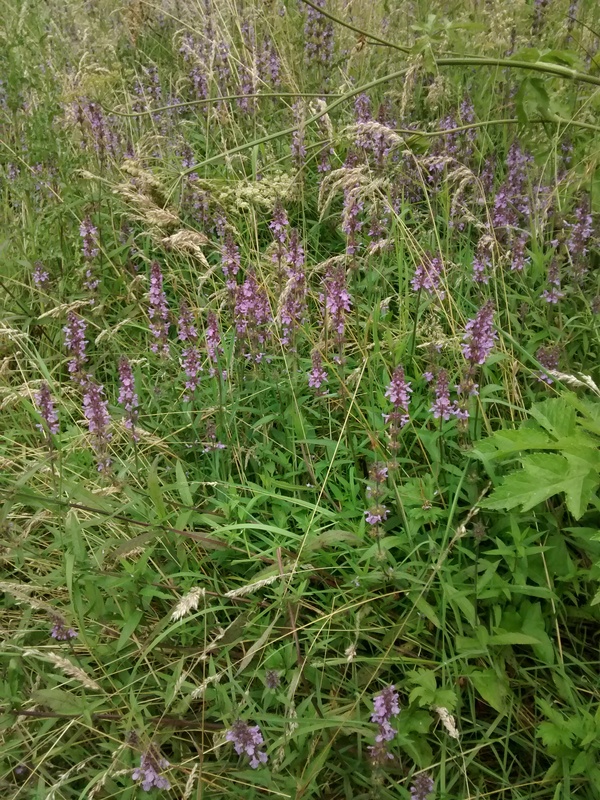 We were able to extend clearance further up the riverbanks in Mousley Bottom, and DCC/NMTC undertook some brushcutting which greatly helped tackle some of the large swathes choking the meadows. 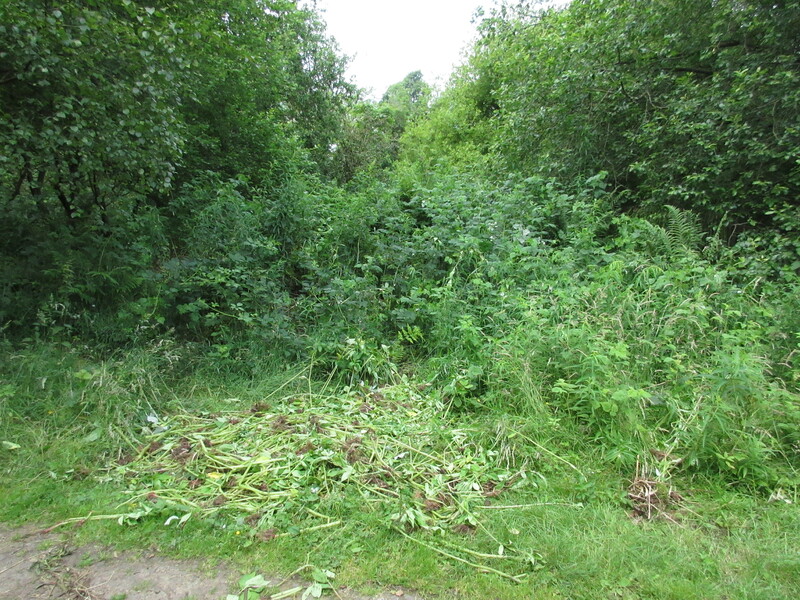 The Picker was a new area for us and, with the permission of the landowner, we took on a demanding task; there are an abundance of wild plants and picking individual balsam plants colonising new areas was hard going. The area was alive with insect life so this deserves to be an area we continue to give more attention to to keep the balsam at bay. New Mills Festival (for help arranging the insurance).